As mentioned in a previous post, Lisa and I just returned from our honeymoon in Italy: almost three full weeks of hiking, sightseeing, riding the rails, and of course, eating! Our first week in Italy was spent far north, hiking in the Dolomites. Hiking up there bore little resemblance to hiking in the States, due to the presence of rifugios — overnight “huts” that free overnight hikers from having to pack bags, tents, food, etc. These “huts” are more like small hotels/taverns that serve full meals, beer, and wine. What could be more enjoyable than spending a long, taxing afternoon on the trail, and discovering that right at your destination is a hot plate of food and an ice cold beer? The food of the Dolomites is heavily German-influenced: strudel, sauerkraut, and wurst made frequent appearances in menus. Our favorite find, however, were canederli, tennis-ball sized dumplings usually flavored with speck, a juniper-flavored prosciutto. We had them alone and served in a broth, and loved them in any preparation. Mushrooms were also very popular in this region of the country, and by the time we left the mountains Lisa was ready for funghi-free food. 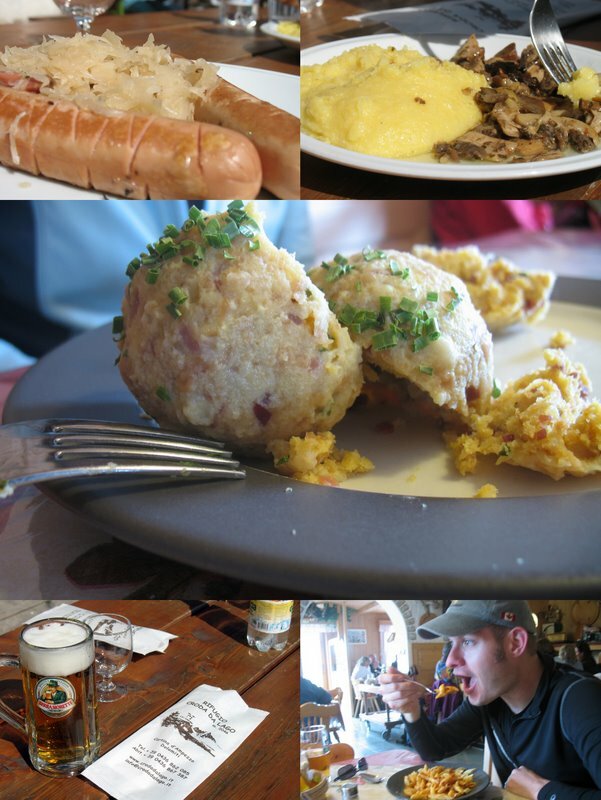 We were able to find a cookbook that featured many of the local Dolomites specialties, so look out for some canederli to be featured her relatively soon. Next up… delicious dishes from Rome, Venice, and the Cinque Terre.